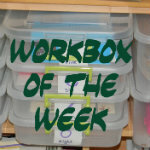 Modest Mama: Workbox of the Week! We're back! After a brief break from Workbox of the Week I am glad to say that we are trying to resume our normal weekly blogging routines. Margaret is really coming a long in her Pre-K/ K learning year. She knows all her letters and letter sounds. She is beginning to sound out simple words and can create simple words I say with letter tiles. One area that she is currently struggling with is writing. 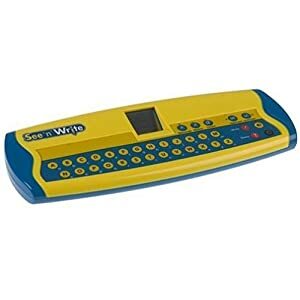 I really like this thing and it is perfect for the workboxes because Margie can complete her letter writing practice completely on her own. It has a little screen that looks like a sheet of paper and writes the letters on it for your student to follow. It is a little noisy, but has volume adjustment and a port for headphones. It's definitely an investment. I think I saw it over on amazon for around $25. I got it on the Educational Insights Facebook Page as a deal of the day.